The letter L . . . don't know why it's hard for me to feel inspired with "L". I am trying to use at least one new pattern daily. I find it really easy to get into a rut using the same patterns over and over. None of the patterns used in my "L" are new but I did use a different aura which put me a little out of my comfort zone. Also the design is not enclosed in a "box" and I'm still experimenting. 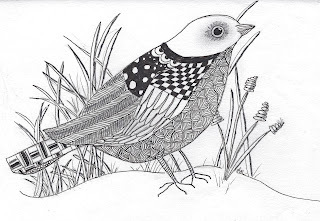 The great thing about Zentangle art is that if you don't like it one time, you can put it aside and then pick it up later and see it differently. This one is growing on me. This past Saturday I taught an advanced Zentangle class at K-2 Scrapbooking in Sarasota. While discussing the class with owners Kathy and Jessica a couple of weeks ago, I saw this adorable tray that they sold. 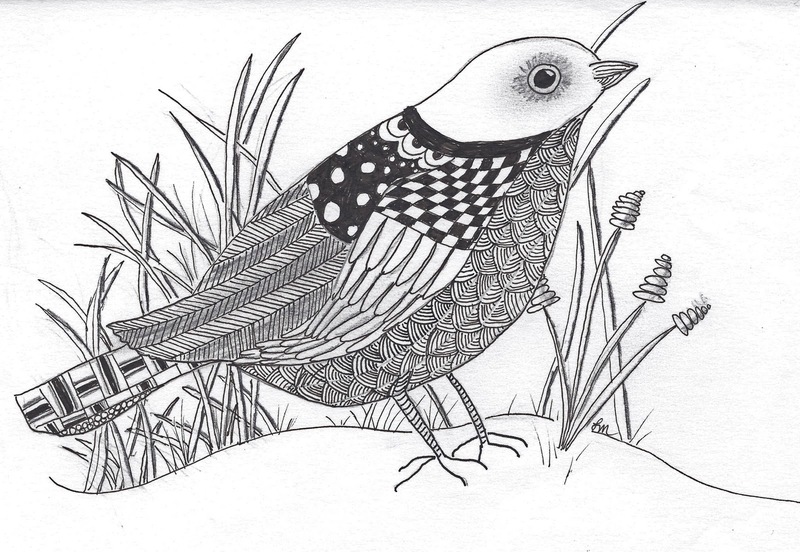 This is the result of that purchase which I made to show the versatility of work that I had done. This is the first time I have used color with any project. I still prefer the black and white, but I like the brightness of color too. It opens up a whole new avenue of prospects. I really like to add just a simple dash of color only that really stands out and calls attention to itself. I think this worthy of being hung in my husband's office. At least he says he like it. 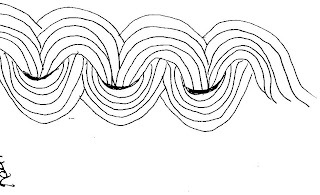 Me, I just love the way any tangling turns out - looks so artistic! Yesterday was my 42nd wedding anniversary. I received 2 very special gifts. The first twenty-five long stem yellow roses who still considers me his "Yellow-Rose of Texas" Ahhhhh - isn't he sweet?. 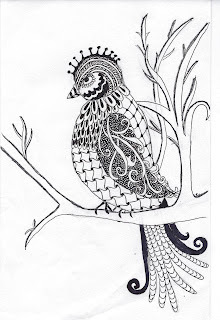 The second, a card from a doubting Thomas friend who held out (until captive) learning to try Zentangles. She decorated the envelope for me to show that she approves of the art form after-all. Even though she will never see this blog, because she is also refusing to learn computers, Thank you, Nancy. My day was complete as Barb and I were able to meet a friend we had met in Whitinsville, MA at our CZT class and show her around the Tampa Bay area. Camera lost, camera found!!!! I thought I had left my camera on board the flight from Richmond to Orlando. But buried deep in the depths of the green suitcase, it was hiding. 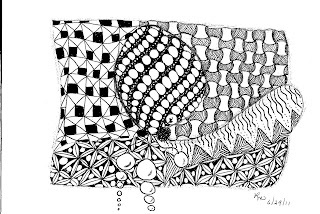 I thought I had lost all Robbie's 3 year old birthday pictures as well as the pictures of the Zentangle work that the group from Marianne's church did. Sorry it took so long t0 post. These 2 are 10 year old twins that I teach on Saturday mornings before their piano lessons. They are delightful. 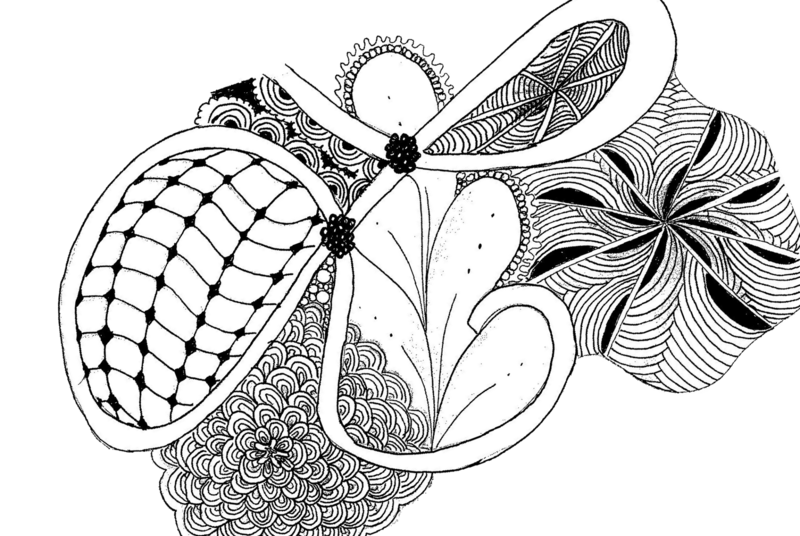 Their teachers have discovered that Zentangle calms them down and allows them to focus on the task at hand - mainly their piano lesson. 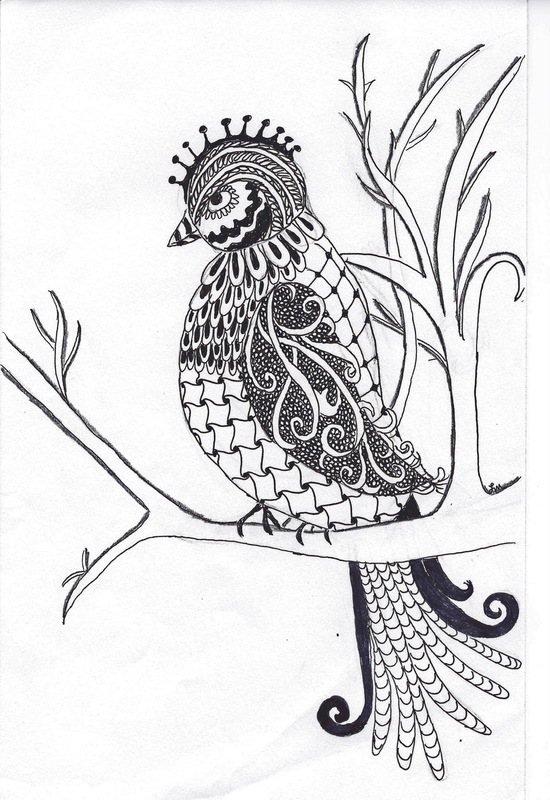 Zentangle has more to offer than just art ! Well, yesterday was a blast. Except for flying down to Sarasota on I-75 at 20 mph, everything was great. 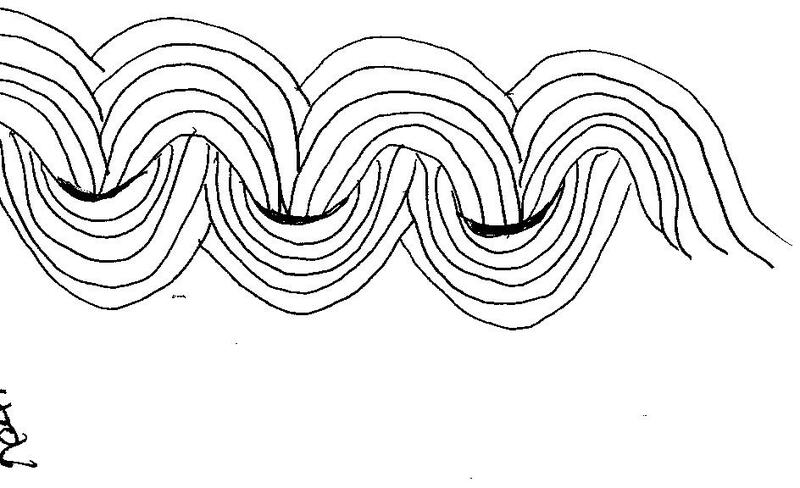 There were 12 women at K-2 Scrapbook Studio anxious to learn about Zentangle. Some had investigated it online and others had just seen some of my posted work in the store. But by the time our 2 1/2 hours were up, everyone was excited and pleased with what they had accomplished. They were a very talented group with no one having any problems. Most have signed up for another class, after Easter. So rewarding. 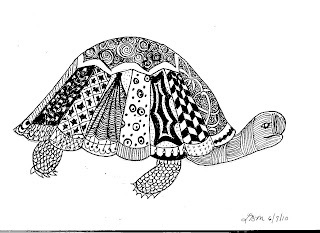 One woman found me through a Quilting magazine that lead her to Zentangle.com which lead her to a list of Certified teachers (CZT) I feel famous!!!! Looking at their tiles all together, didn't they do a GREAT job. 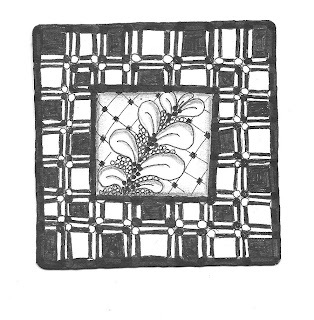 Zentangle: Fabric Arts, Quilting, Embroidery . I put a name tag on it with my name so that I wouldn't need to print one out each time. Tomorrow I will teach my first class at a store and I hope this will encourage them (and me) to be inspirational! The star was done separately and now becomes my pocket for pens. I feel so clever! I never thought I would have my own blog. 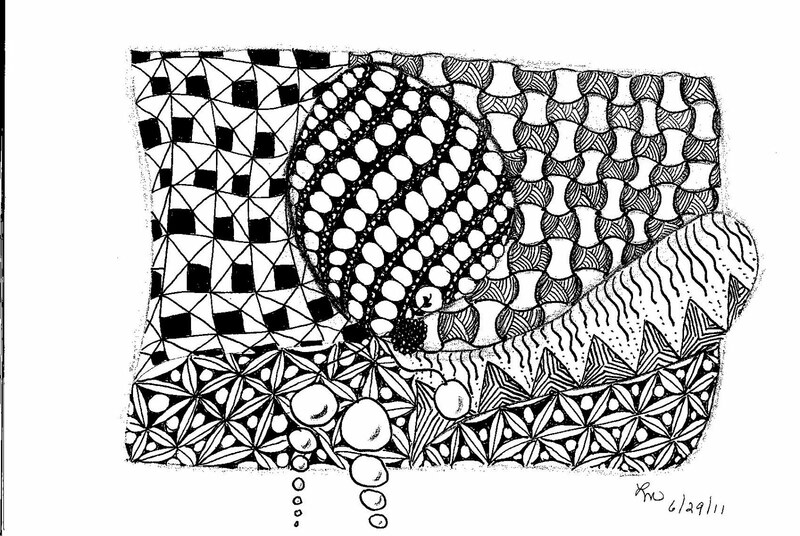 But I want to use this as a showcase for some of my latest loves - Zentangle (R). Zentangle is a simple but very soul satisfying artform that is suitable for everyone. 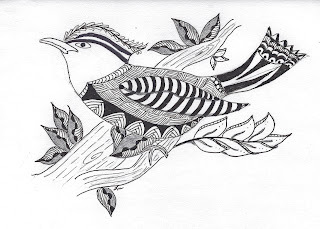 It can be done by the young and old alike and each age can find immense satisfaction in creating something beautiful. There are no failures. There is no criticism. There are no erasers. What is better than that? 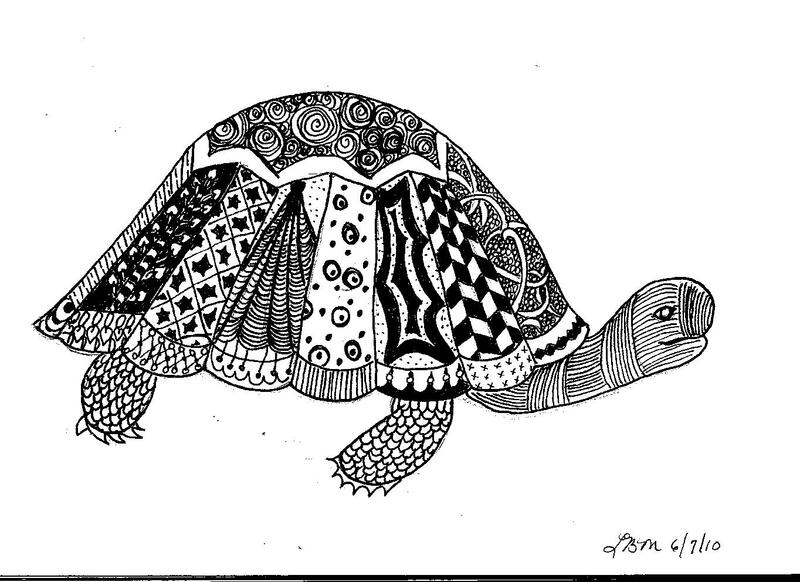 Zentangle (R) is the brainchild of creators Maria Thomas and Rick Roberts of Whitinsville MA. 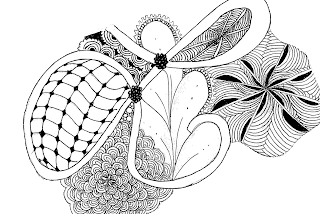 Maria, a very talented professional calligrapher, was caught relaxing and drawing repetitive shapes and designs when Rick noticed her Zen like state. From there the process began. They began teaching classes with students coming from all over the world. I was in class 4 where there were 2 from Australia, 1 from France, and another from Hong Kong as well as all over the United States. They have just graduated their 5th class. 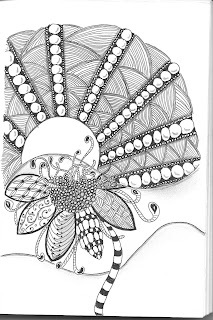 We graduate with the title of CZT (Certified Zentangle Teacher) I think that I am as excited and proud of those three letters behind my name as the BA I got 40+ years ago form Emory University. I am sure that I enjoyed the experience more. I hope to inspire plain ordinary people like me to create and try something new. But this is not only a satisfying self indulgence. It also serves a very real purpose in relaxation and focus. I decided to do a little experimenting by teaching two 10 year old twins who suffer from pronounced ADHD. Their piano teacher complained that they were very diffuicult to get to focus on their classes and would be up and down and fidgeting throughout class time. I worked with the children for 15 minutes prior to their class, teaching them simple drawing patterns. They would leave me and go to their piano lessons prepared to sit and play. It make a remarkable difference in them. This was not just a one time thing. Every week I worked with them, the results would be repeated. When I was unable to draw with them, disaster at the piano. 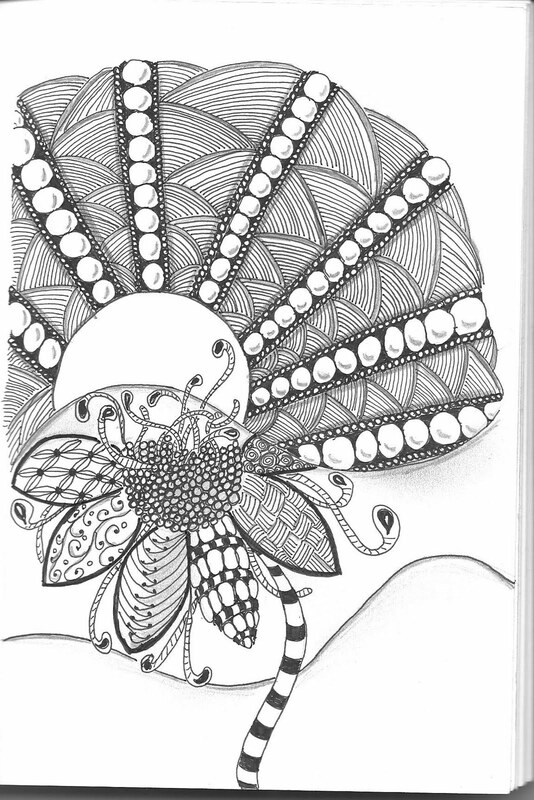 Doing the Zentangles causes the brain to slow down and focus on the project at hand. This is just my observation but it has made me a believer in the possiblities of the hand and mind working in tandem.